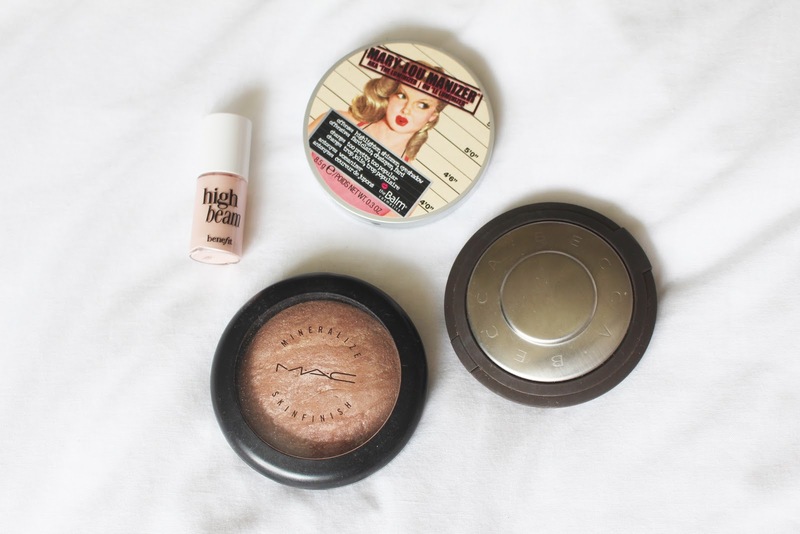 It's time to talk about my highlighter collection. 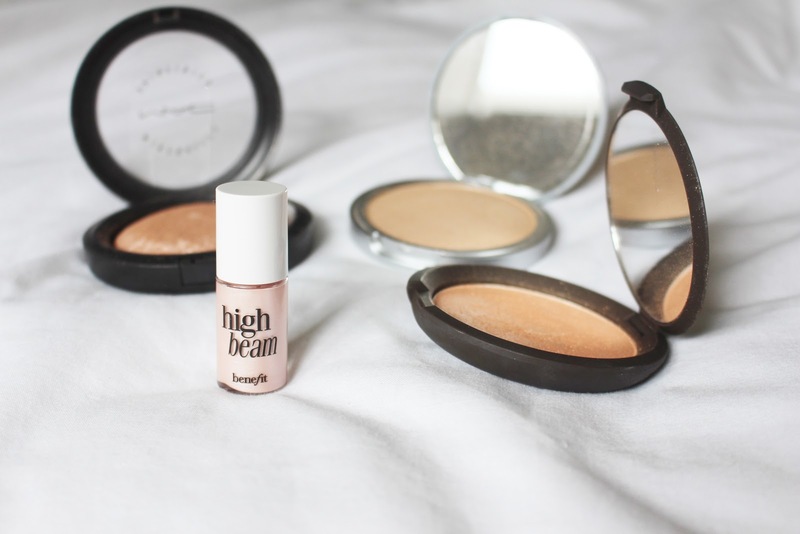 This post has definitely been a long time coming as I am obsessed with highlighter's and I do love mine pretty intense and noticeable. I'm normally fairly understated and although when I wear makeup I use quite a few different products on my face, I like to think that I'm not normally caked in it nor do I look 'fake' or extremely different without makeup on - if you know what I mean? I like my makeup to enhance what's already there. So, I own four highlighter's in total now and they're all completely different shades that would suit all different type of skin tones. 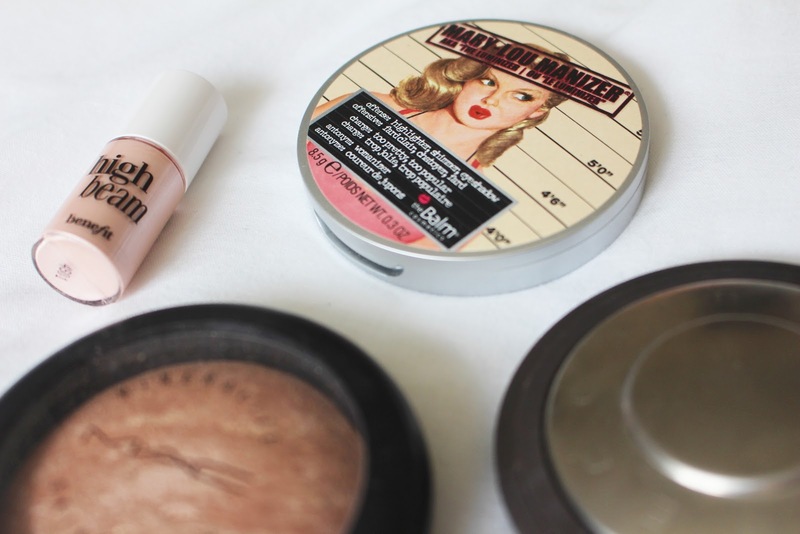 I have MAC Soft & Gentle, Mary-Lou Manizer by theBalm, Champagne Pop by Becca Cosmetics and Benefit High Beam. Two of them are more subtle and natural-looking and the other two, well.. Let's just say that they're not for the faint hearted! When I wear makeup I never skip the highlighting step because, to me, it just ties my whole makeup look together and gives me that extra little pop that I feel is always needed. 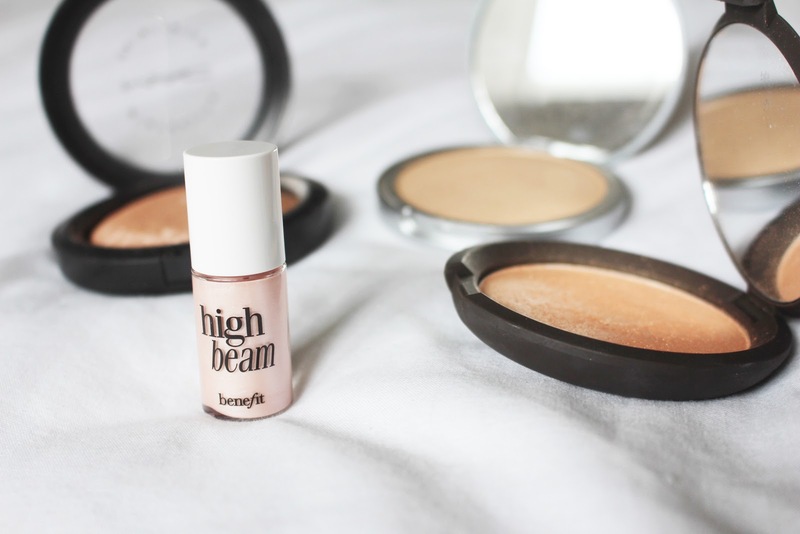 Benefit's High Beam is the latest edition to my highlighter collection and it was part of a gift set I received at Christmas time so it's a mini size which is just perfect as I definitely could not use up the normal size! I do have to admit that I wasn't really interested by this product as I have tried it before and it definitely did not wow me. However, I have recently been using it as a base underneath MAC Soft & Gentle to intensify that and it's been working beautifully. I also feel that this cream highlighter would be great for those days when you're not fussed about setting your whole face with powder. 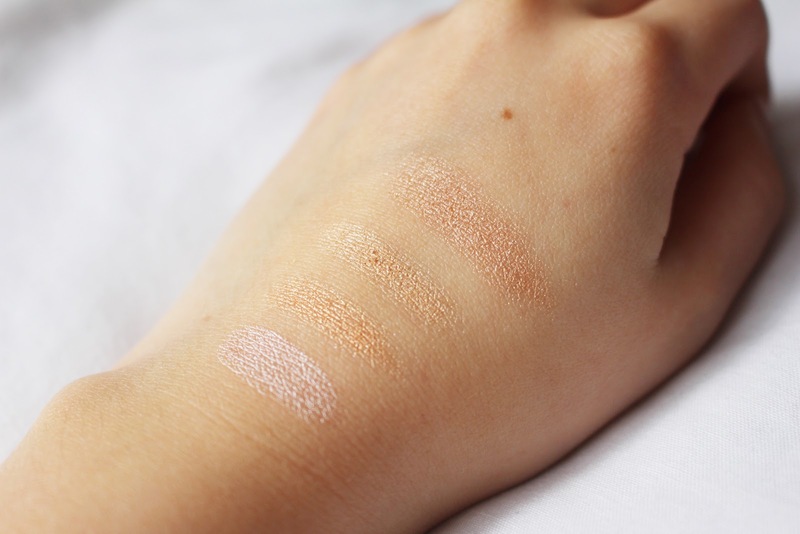 It definitely does give quite a subtle glow and because it's a cream I do find it a little hard to blend out evenly but the colour is super pretty and subtle and I reckon I'll be using this a lot more during the Summer months. MAC Soft & Gentle was the first highlighter that I ever purchased and I was inspired by Shani Grimmond. She used to use this highlighter religiously in her YouTube videos when I first started watching her and I was only just interested in makeup at that time and this was definitely the perfect first highlighter to kick start my addiction with. 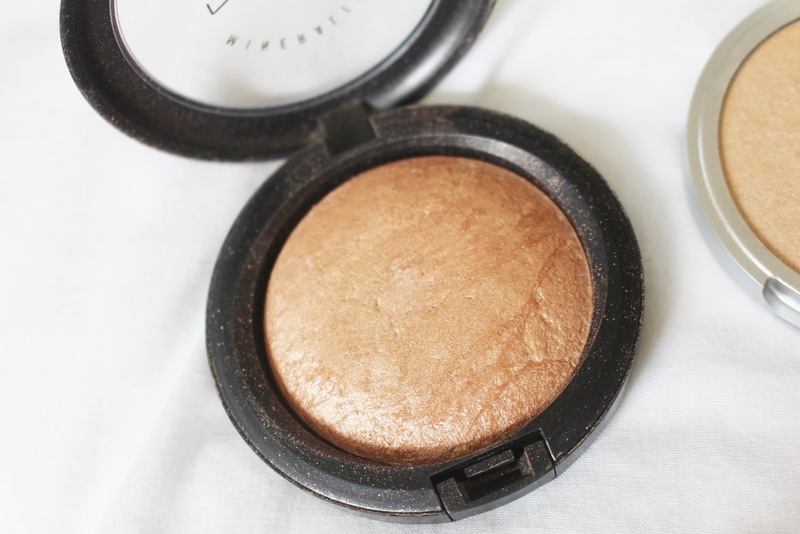 It's described as a 'gilded peach bronze' which I do agree with to a certain extent, I definitely think it's more bronze than peach but it gives this very natural looking sun kissed glow to your cheeks that is perfect for anyone looking for naturally highlighted cheeks. I don't use this as much as I used to but I still love it a lot and would recommend it to anyone. I waited a fairly long time to purchase Mary-Lou Manizer and I honestly couldn't tell you why. I can tell you though that I do regret waiting as long as I did because she is an absolute beaut of a highlighter. 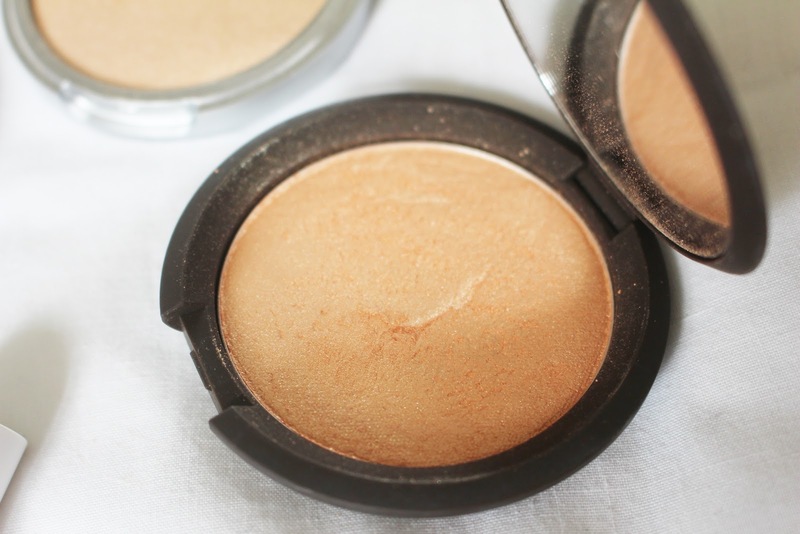 A perfect match for you fair skinned gals out there as it's quite a yellow/white based highlighter that diffuses to a very light shimmer on your cheeks. This highlighter can definitely be made as intense as you desire but it can also be subtle if you apply a minimal amount to your brush. Oh my goodness, the best news ever - Cult Beauty now stock Champagne Pop which means us UK peeps can now order without the extortionate US shipping costs! I'm super happy about this and this probably hasn't just happened but hey, some of you may be oblivious like me and this is also great news for you! 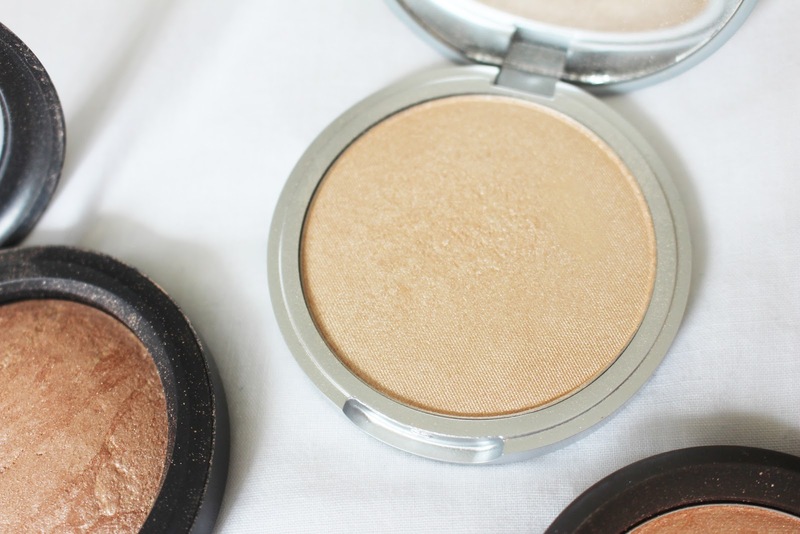 Champagne Pop is my favourite highlighter from the whole bunch and is the one I use on a regular basis. 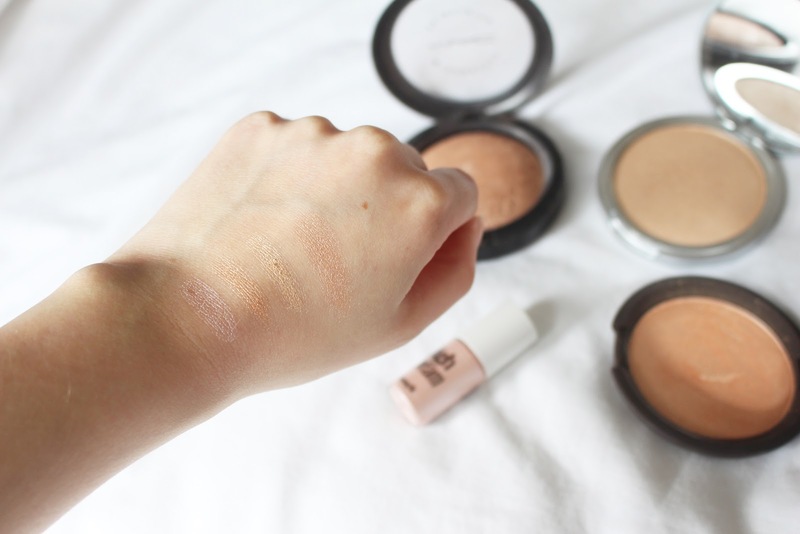 It's very intense and is a perfect apricot/peach/gold highlighter suitable for multiple skin tones. I really don't feel like the apricot/peach undertones show at all once applied to your cheeks as I'm pretty pale (well, my face is anyway and extremely so) and it doesn't show up on me. If you have the money to spend £32 on a highlighter then I recommend it - you will not ever look back I promise! The swatches above have been applied using my finger and I have packed it on just to give a true representation of how different these highlighter's are to one another, however fear not, they do not look like this once applied on the cheeks so don't freak out! I'll also say that none of these highlighters have huge chunks of glitter in them so don't worry about looking like a glitter ball as this won't happen with any of these little gems. I am very happy with my highlighter collection as it stands and I cannot wait to add more to it. If you have any recommendations then I would love to hear them, I've seen that Sleek do an amazing highlighting palette that is very affordable so I'll definitely be adding that one to my collection very soon. 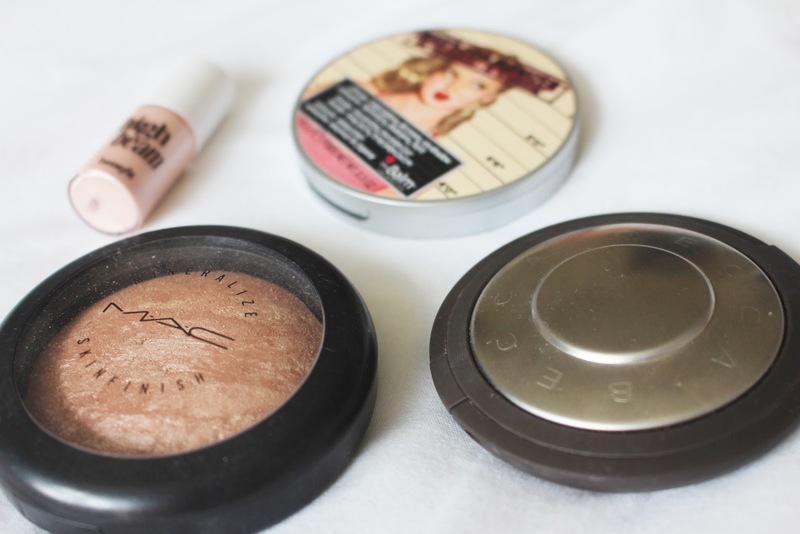 I love MAC Soft & Gentle, such a gorgeous highlighter - really want to try theBalm Mary-Lou Manizer as well!